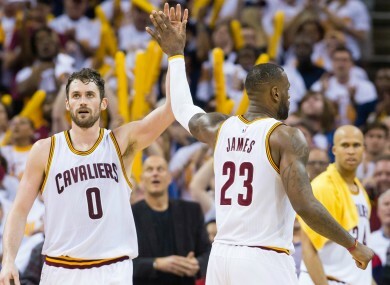 LeBron James and Kevin Love of the Cleveland Cavaliers during last night's game. THE CLEVELAND CAVALIERS’ star trio came up big as the Eastern Conference champions opened their playoff campaign with a 106-101 win over the Detroit Pistons. Reunited for the first time in the post-season since last season’s first round, LeBron James, Kyrie Irving and Kevin Love combined to lead the top-seeded Cavs past the relentless Pistons in game one of their first-round series in Cleveland on Sunday. Irving posted 31 points, while Love — who dislocated his shoulder in last season’s fourth playoff game — contributed 28 points. James dished up 22 points and 11 assists in a double-double display. Seeded eighth in the Eastern Conference, the Pistons, who had a seven-point advantage erased inside the last 11 minutes when the Cavs went on a 30-18 run, were led by Kentavious Caldwell-Pope (21 points) and Marcus Morris (20 points). Elsewhere in the East, the Miami Heat dismantled the Charlotte Hornets 123-91 in game one. The San Antonio Spurs had a far easier assignment on home court as they crushed the Memphis Grizzlies 106-74 in the opening game of their Western Conference first-round series. With Marc Gasol, Mike Conley and Brandon Wright absent, the West’s top-seeded Spurs condemned the Grizzlies to a 32-point loss in San Antonio. Kawhi Leonard scored 20 points, while LaMarcus Aldridge and Tony Parker added 17 point 15 points respectively. Vince Carter led the Grizzlies — seeded seventh — with 16 points. Out West, the LA Clippers easily accounted for the Portland Trail Blazers, 115-95. Email “Cavs, Spurs, Heat and Clippers draw first blood in NBA playoffs”. Feedback on “Cavs, Spurs, Heat and Clippers draw first blood in NBA playoffs”.